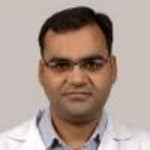 Dr. Ashit Gupta is a dynamic cosmetic and hair transplant surgeon with a vast experience of more than a decade. He is credited to have performed hundreds of Hair Transplants. His expertise lies in performing Mega Session Hair transplants grafting more than 5000 Hair Follicles in one session. He is one of the few Hair transplant surgeons to have mastered the art of FUE hair transplant. -PROFESSIONAL WORK EXPERIENCE- Clinical Assistant in Plastic Surgery - Rajiv Gandhi Cancer Institute and Research Centre-Consultant in Plastic Surgery - General Hospital, Panchkula- PROFICIENCIES-Follicular Unit Extraction (FUE) Hair Transplantation, FUT with Strip Method, and Body Hair Transplant (BHT)- Lasers for Hair Reduction, Scars, Body Contouring, Tattoo removal, Facial Skin Rejuvenation- Male Breast Surgery,Breast Augmentation / Reduction Surgery, - Rhinoplasty- Liposuction, Abdominoplasty- Face Lift, Scar Correction- Botox and Fillers.